‘Would you ever move out of London?’ I asked my friend as we left Edinburgh airport in our taxi. Her reply? Of course not. We’re spoiled in London. There is a comfort of knowing that there is always something to do, even if you don’t actually want to be doing anything. Then of course there are the restaurants, there are loads of greats. When we go on holiday (this was our first one together), we actively seek the best places to eat. No surprise then that both of us were quite rightly excited about dining at The Kitchin for lunch. We were greeted by a familiar face at reception, a girl that used to work with us in London. Having lived in London all of her life, she decided she wanted to break away and embark on new foodie adventures. One may think that Edinburgh isn’t the obvious choice but read on and you’ll see why it is. Our coats were hung and champagne glasses clinked. 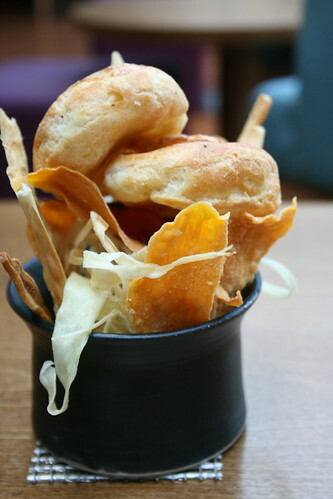 A basket of freshly baked bread sticks, cheese puffs, anchovy sticks and vegetable crisps made their way over to our table at the bar. ‘Cheers’ we announced before burying our heads in the menu. It didn’t actually take us very long to decide. It wasn’t to be the set menu, after all we didn’t know when we’d be coming back. To our surprise (and it seemed everyone elses), we unanimously chose the same dishes. Now, let me tell you that this doesn’t actually matter. One of us would probably have ended up with massive food envy and thrown our plate at the wall. Definitely not the behaviour for this establishment. We were shown to our table. The restaurant itself is dimly lit, the curtains blocking out most of the sunlight. The tables are nicely spaced out – we sat with our backs to the wall and the whole restaurant in our view. The open kitchen is inviting and looked incredibly relaxed. They know what they’re doing! We ordered the razor clams for starter and lobster thermidore for main. Pudding was to be decided later. Our little friends (the lobster) stopped conversation in it’s tracks when they came out to say their final goodbyes. I’ve had experience of being shown different cuts of steak, but nothing live. They looked… friendly! 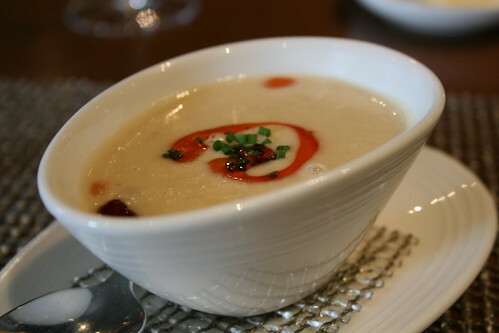 First, another basket of fresh baked goods followed by a coco bean veloute appetiser, served with chorizo and chives. The chorizo rich and intense, working so well with the thickness of the foamy bean. We asked to have a different matched wine with each course, provided to us by head sommelier Murray. The Dampierre 1er Cru Cuvee des Ambassadeurs matched our appetiser. 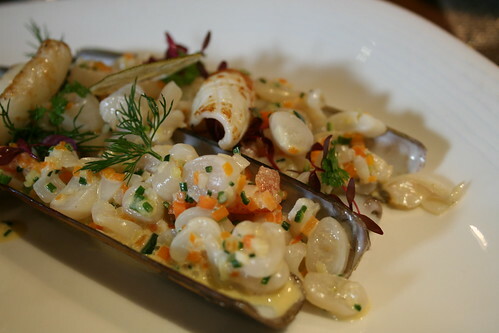 Our first course of Razor Clams (Spoots) shone out at us through the shell they resided in. Served with diced vegetables, chorizo and lemon confit, they were fresh as anything I’ve ever tasted and very creamy! Sommelier Murray brought over a fantastic Chablis 1er Cru ‘Mont Du Milieu’ to match. 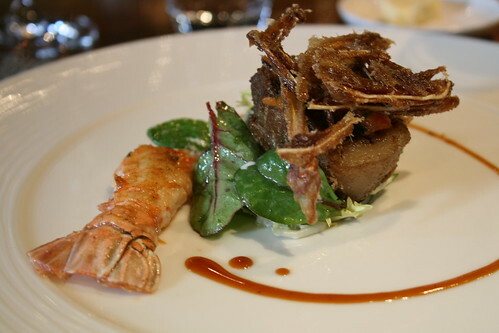 Next came another surprise, a middle course in the form of Chef Tom Kitchin’s signature dish – pigs head and langoustine, which came in the form of boned and rolled pig’s head, served with a roasted tail of langoustine from Anstruther and a crispy ear salad. I’d seen this on the menu and been tempted so I was happy to be able to try it. Now, the name might put a few off but just remember that essentially you’re only eating a different part of the pig to usual and the ear resembles crackling, but again just from another part of the body. It was delicious, rich and creamy, oh I could eat it every day! Murray brought a glass of Gewurtztraminer Hugel to match. By this time we had 3 different glasses of wine lined up on our table waiting to be drank. Must. Drink. Faster. Our Lobster mains came and were rich and intense. 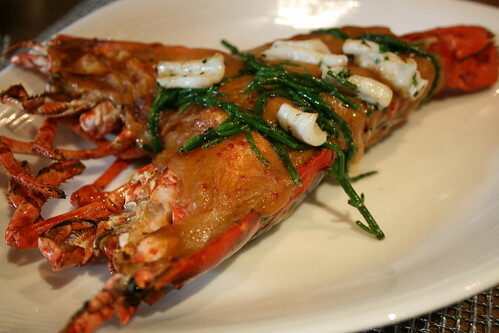 The lobster (from Newhaven) was cooked Thermidor style and served with buttered samphire and sauteed squid. Due to all of the food that we had already eaten, I started to wish I had ordered something lighter but it didn’t stop me from devouring as much of it as I could. Half way through, we spotted little black eggs. We dug deeper and saw red eggs. Confused, we asked Murray who explained that the lobster is taken out of the shell to cook. The black eggs are the cooked eggs that were taken out with the meat and the red ones are the uncooked ones that stayed in the shell. For those of you who have shell fish phobias (my friend), this does NOT mean that the lobster is not cooked. The red eggs will not harm you. Our matched wine for the lobster was Pinot Gris ‘Little Beauty’. Next – and do realise that we didn’t order a tasting menu so we were eating full blown portions. As you might imagine we were very full (and slightly tipsy!) We chose separate puddings. I opted for Plums & Honey – spiced British plums served with Heather Hills honey parfait and a plum crumble and my friend the Pistachio Soufflé that we saw our fellow diners on the table next to us tucking into. The Plums & Honey was a complex dish with a myriad of different plums plus a creamy and fluffy parfait, delicious. We swapped dishes and I tried some of the pistachio soufflé with Pistachio ice cream, I had food envy. See, this is why it pays to have the same dish. Luckily I still loved my pudding so the wall didn’t see any plate action. More wine? Yes! This was my favourite – i’m not usually one for dessert wine but it was just fantastic – Ice Wine, Cabernet Franc. Next – yes, really. We were brought a plate of petit fours with the coffee that we ordered. The pistachio nugat blew me away – apparently new on the menu. We’d made it to the end and had a marvelous time on the way. The service is impeccable, the reception and waiting staff extremely helpful, the food prepared using their moto ‘from nature to plate’ and, well, you can well understand why Chef Tom Kitchin was awarded his first Michelin star in 2007, a mere 6 months after opening! If you ever have the pleasure of tripping to Edinburgh, I urge you to go and visit The Kitchin!